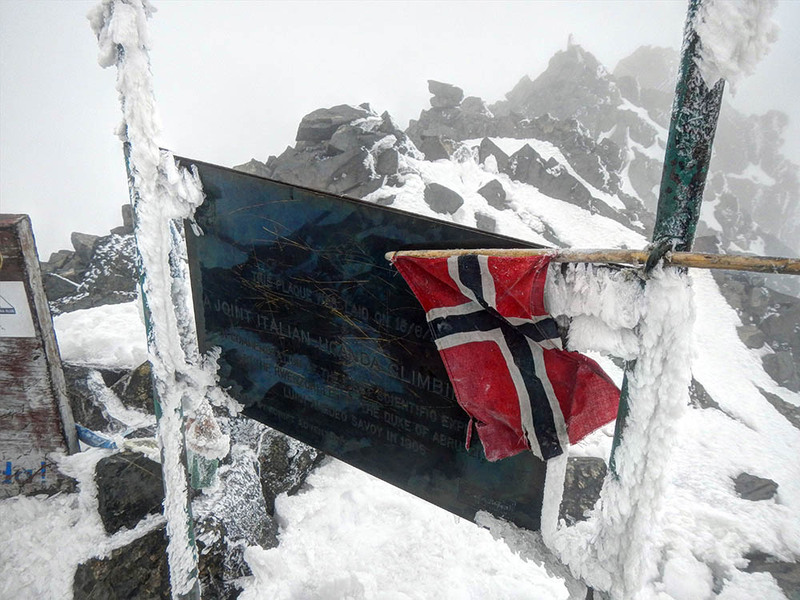 This is a continuation of Jørn Eriksson’s hike up the Rwenzori Mountains, where he finally reaches the summit. In case you missed the first part of his journey you can read it here. 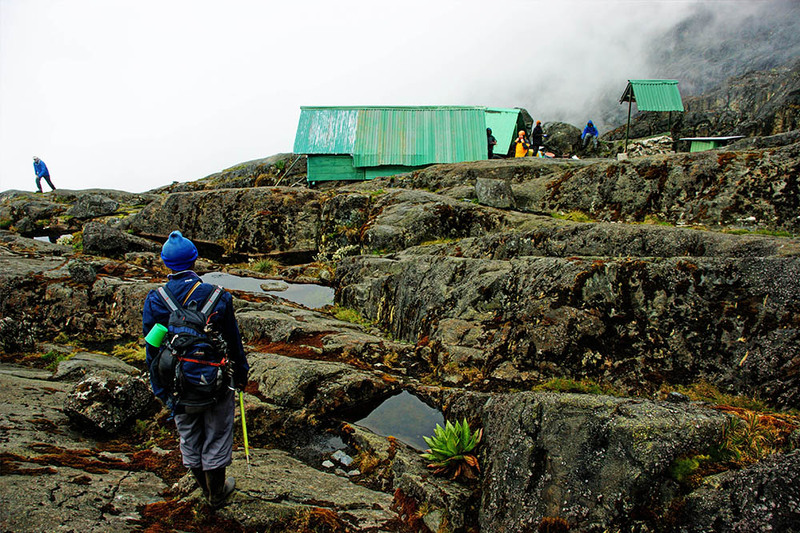 It normally takes 3 days to hike up to Bujuku Huts which are the base camp for the climb to Mt Speke. From Bujuku it will take a full day to the Mt Speke summit. There are two routes to the summit. One is considerably longer but involves only scrambling Grade 3. 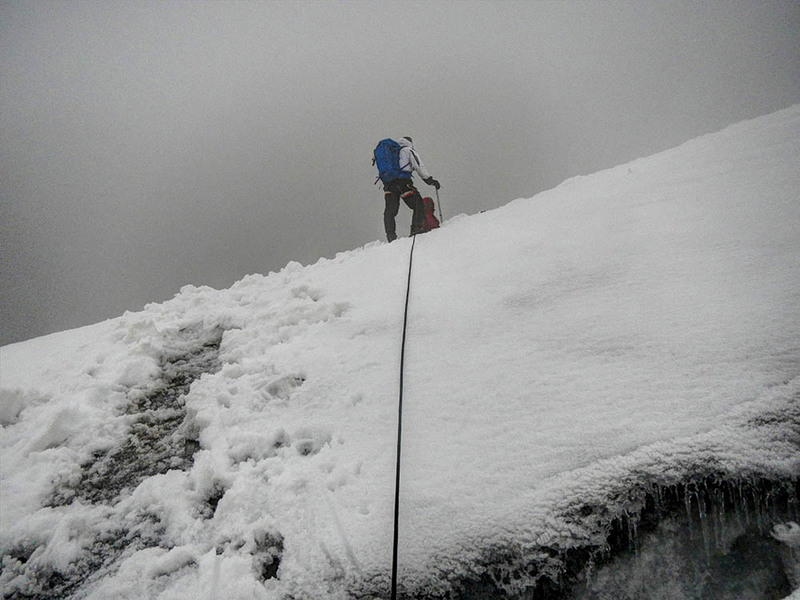 The most common route is a grade 4 route which one has to have a rope, as you will encounter lots of ice and snow. 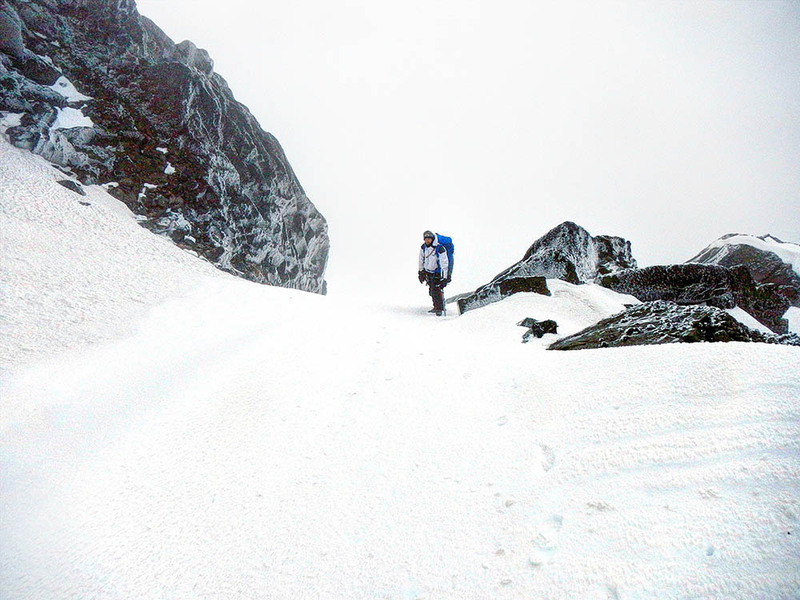 Crampons and ice axe are also needed on this route. 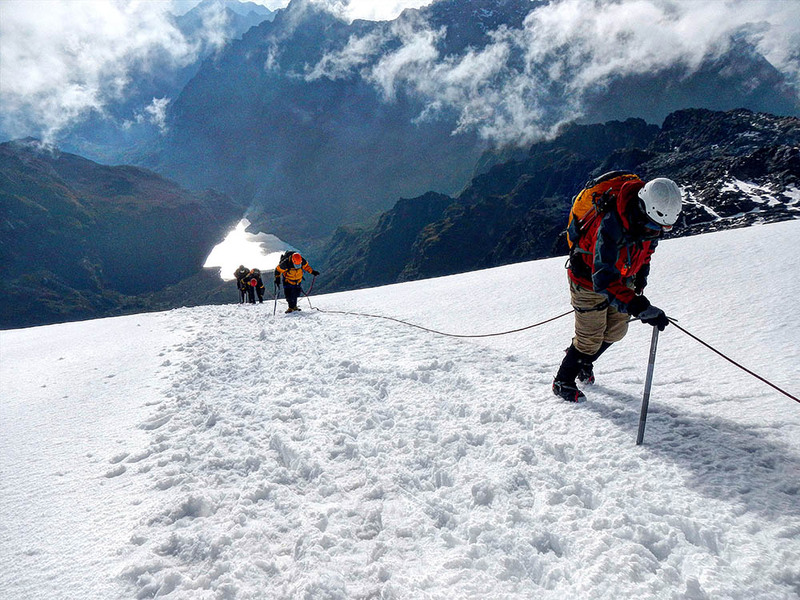 However we didn’t use the crampons since the snow on the glacier was soft. 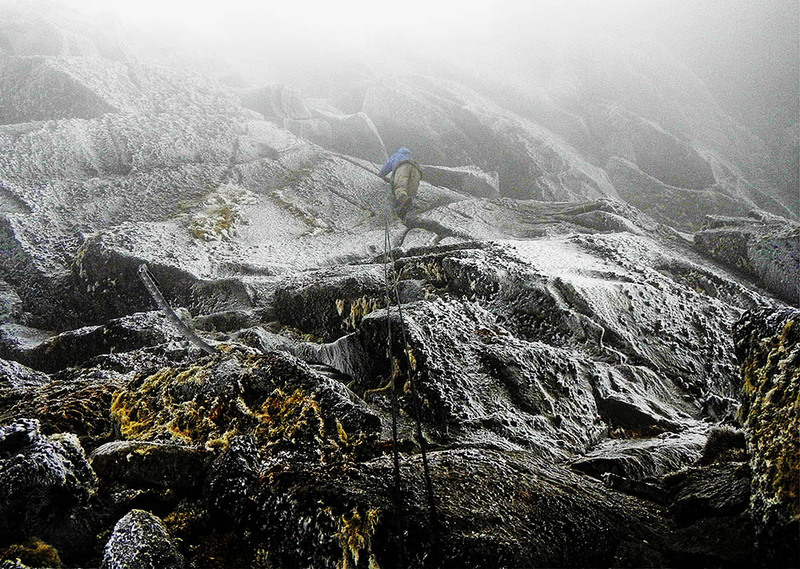 It is however recommended to use rope ascending and descending the crux of the route. We spent 5 hours climbing (including time to pause), and another 3 hours descending. At Bujuku the elevation is 3960 m at the summit it’s 4890m. 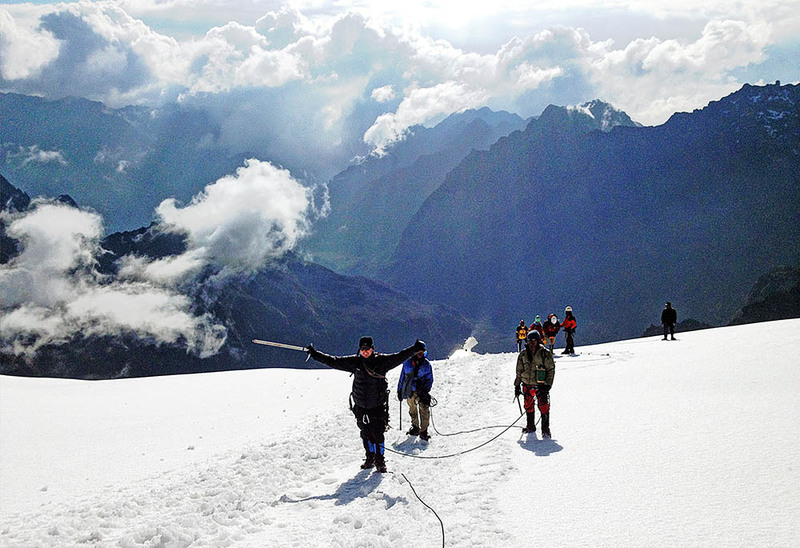 That meant that we had to climb up 930 metres – a challenging task considering the Altitude. We started our journey at 5 AM in complete darkness. First we ascended up to the Schulman pass, at some point the path separates, and we turned right, and the terrain started to get steeper. Not long after we reached the first of the two sections where a rope has to be used, fortunately it was dry so the section was relatively easy. At the top of this slope we had to climb around a hanging tree and then traverse an easy but exposed terrain until the slope got very gentle. In the west one could now view a scenic lake (Lake Speke) on the Congo side. 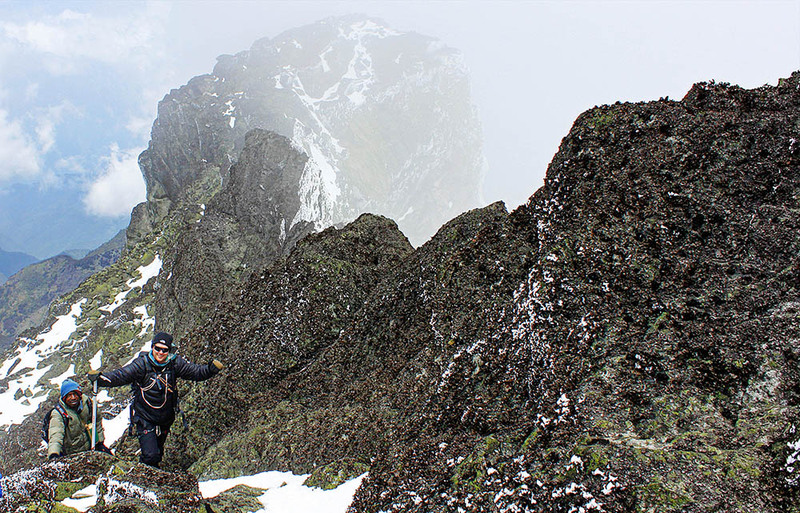 As we walked through some boulders heading for the crux of the route, a steep and icy upper section on the ridge we were now on, the wind was now so severe that we had serious doubts about continuing. We found shelter behind a huge rock and some discussion about what to do. 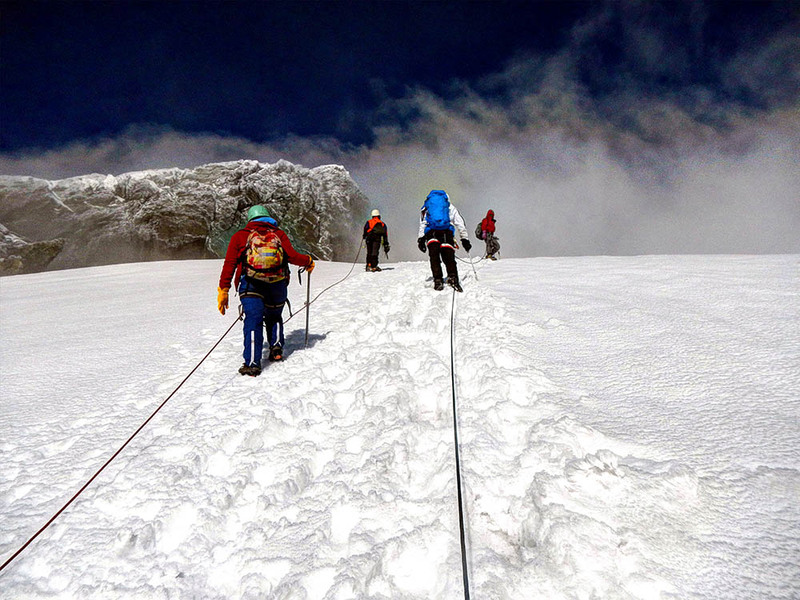 The most experienced guide put on crampons and the other guide went with him to secure him. 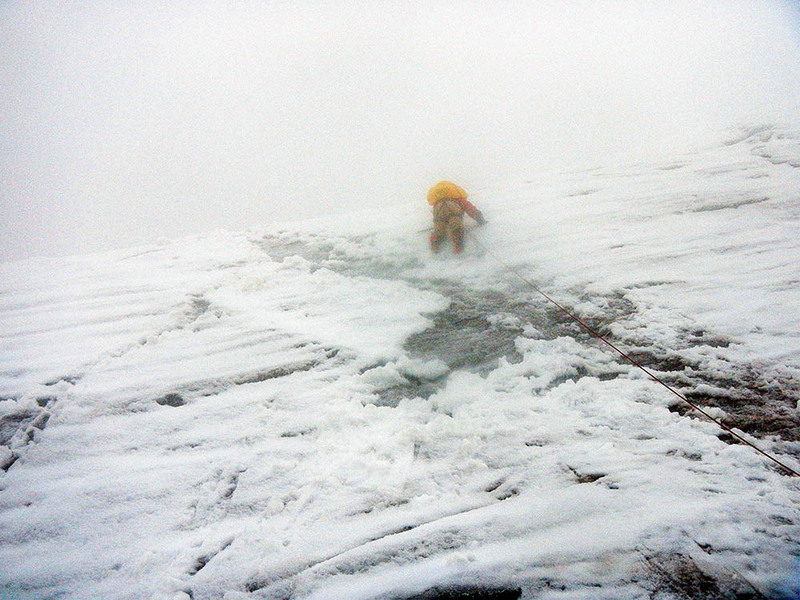 The conditions were now extremely difficult, and we watched with great concern. We didn’t bring helmets on this trip, but that is something one always should consider, as a big rock came falling down towards us. Luckily it didn’t hit any of us. 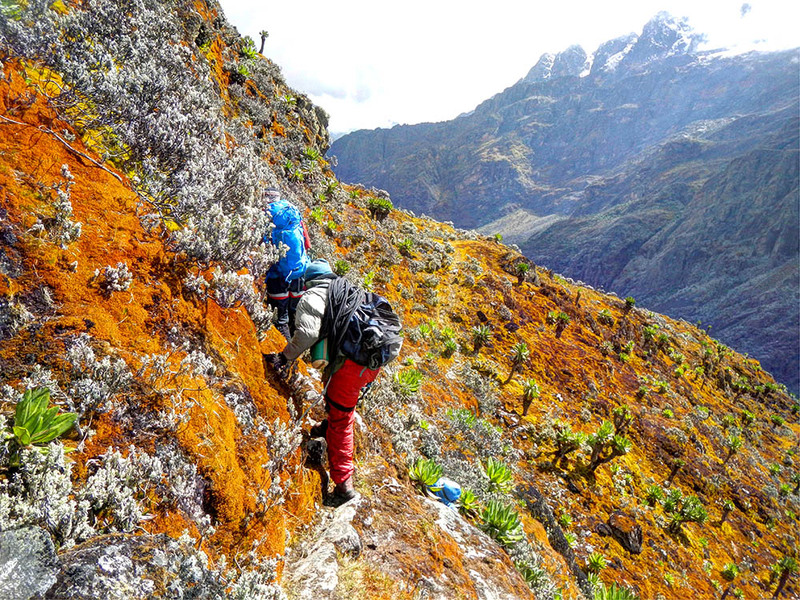 I was told that rock fall was not very common on this route, or in Rwenzori, but one never knows. Anyway, he managed to put up the rope, and a student guide (we had 3 locals with us) climbed up the rope without using a prussic. The result was scary. the student had problems on the icy rocks getting good grips and almost fell. I was properly secured to rope behind and came to the student’s rescue. I used an ascender on the rope, and with this I had no problems climbing up. 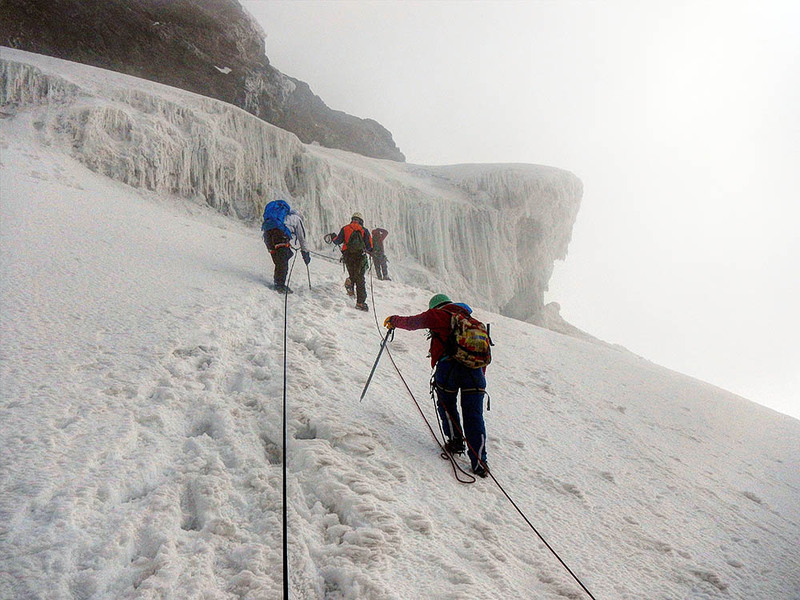 At the top of the rope, we stepped right and up an icy gully. We left the rope at the gully, and the rest of the climb was mostly a scramble with some exposed sections. The wind was still blowing strongly and the vision ahead was unclear. So our guide spent much time trying to find the right way. 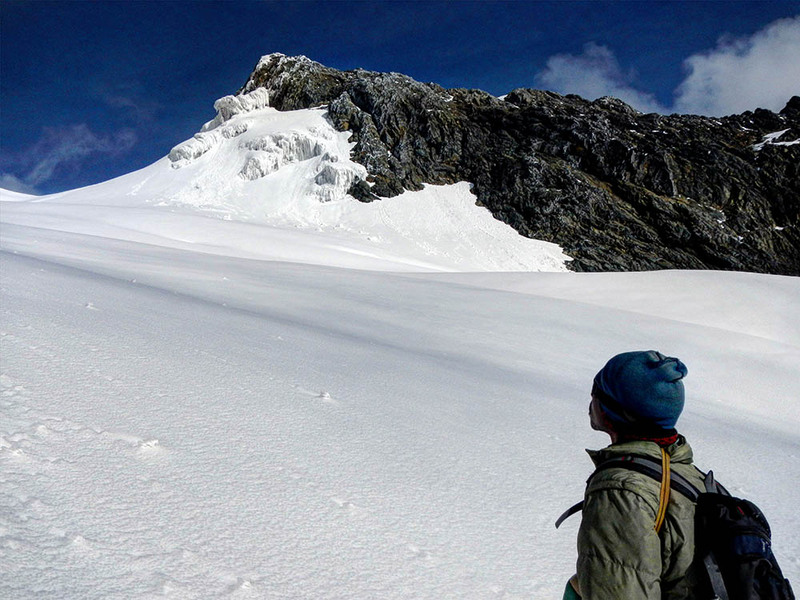 At last we entered the snowfields on the upper glacier. The snow was soft, so we didn’t put of the crampons. As we came closer to the summit the weather also became better, and suddenly we got some brief moments where we could see Mt. 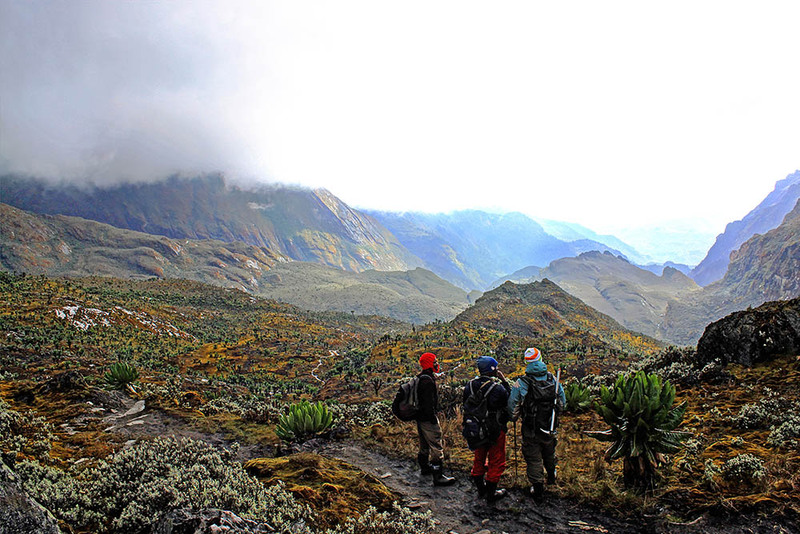 Baker, Bujuku valley, Congo and Mt. Stanley. We continued our scramble going left, and before I even realized it we were at the summit. There was good flat area a few metres below the summit that gave good shelter from the wind, and room for the five of us to have something to eat. When we came back to Bujuku hut that afternoon we were no longer alone. 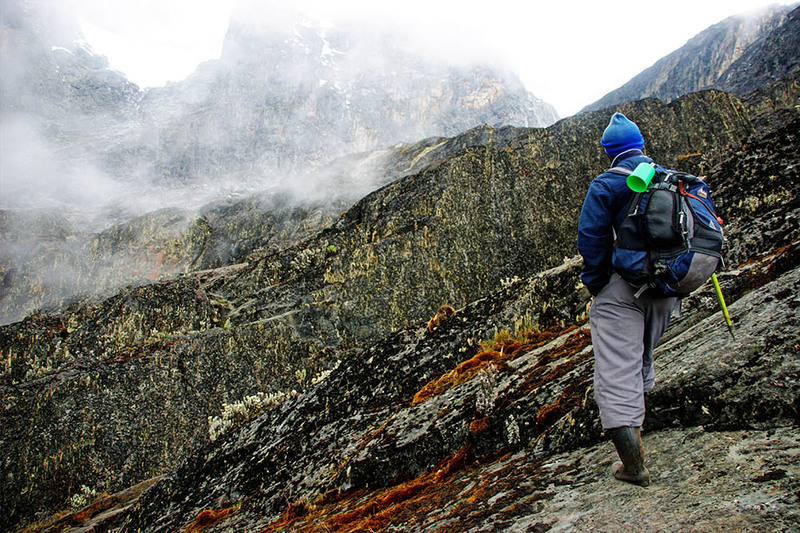 The Kenya Mountain Club had arrived with a group of five people (One Kenyan a Swede, a Ugandan, a New Zealander and an American). 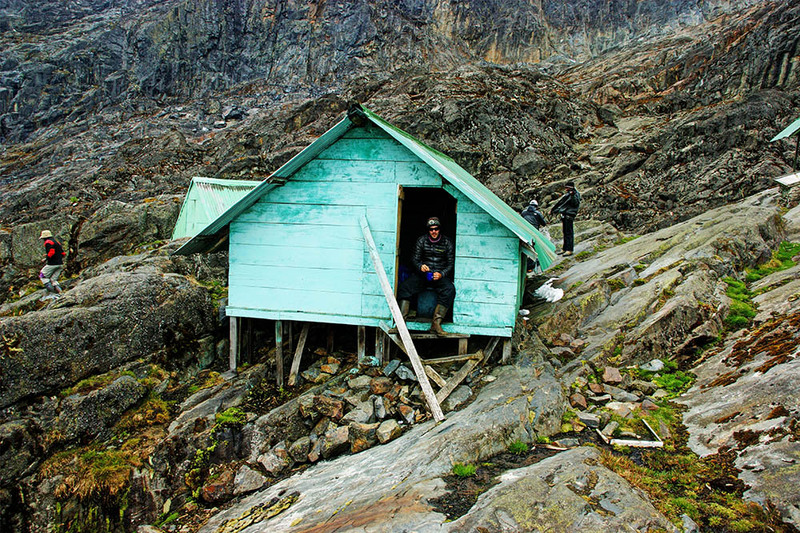 This group followed the same plan as us until after Margherita peak, staying in the same huts and rooms. 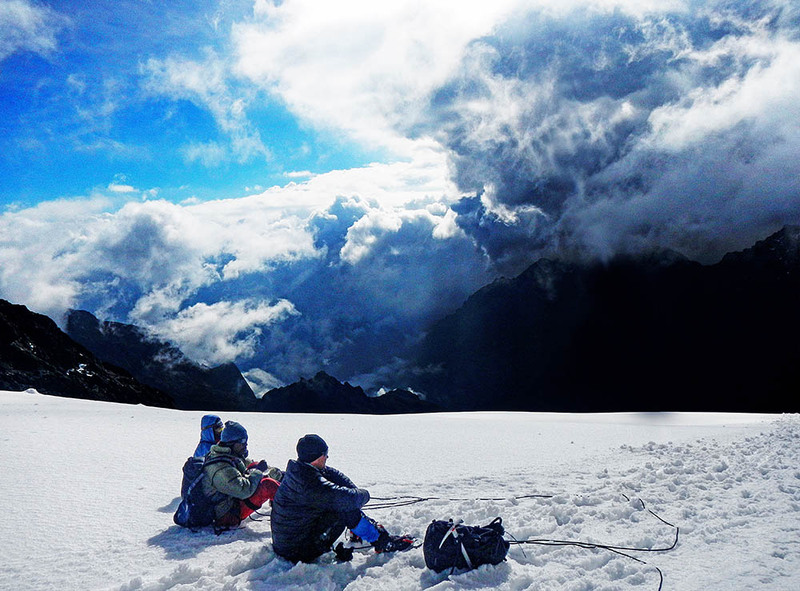 We slept long the next morning, as we only had a short leg going up to our basecamp for the climb of Africa’s third highest point, Margherita Peak. 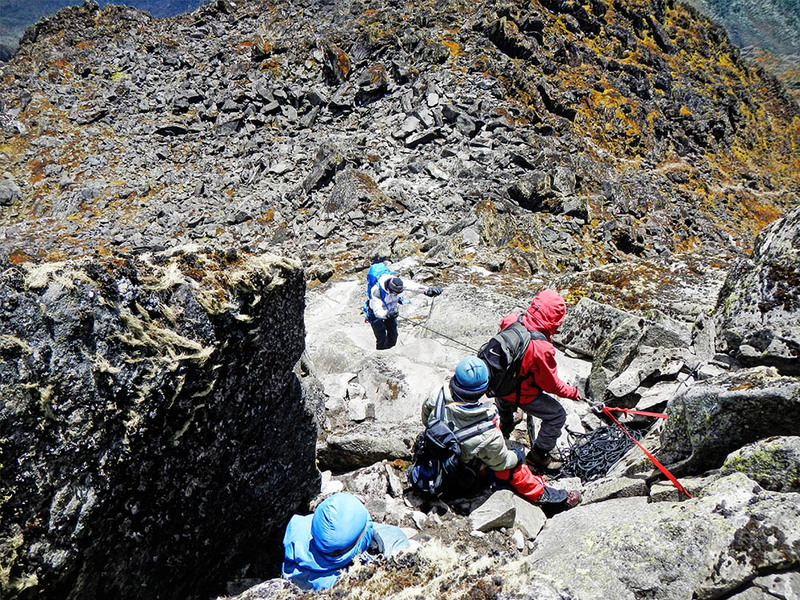 Climbing a steep hill leads the way up to the Alpine zone of Mt. Stanley. 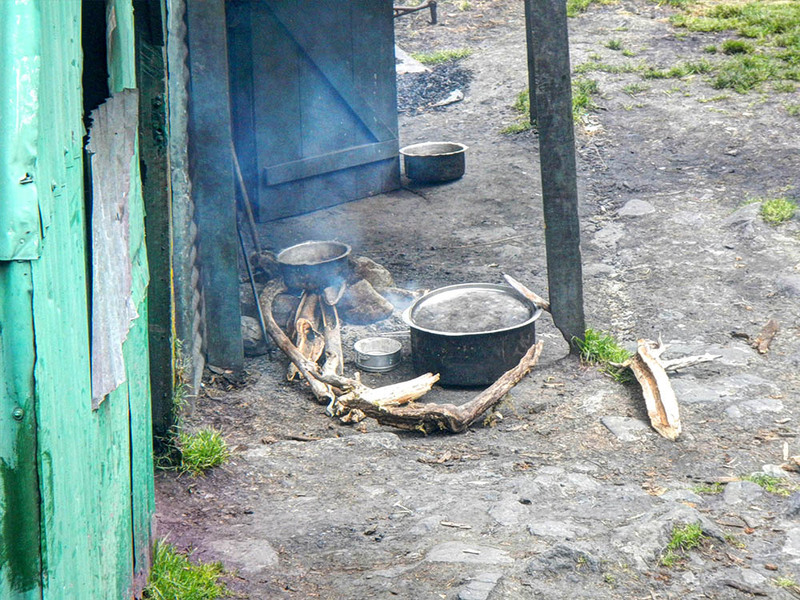 We made it to the Elena huts, there is no running water at Elena huts, only still water in a few pits. This taste bad, but the porters drink it. We did too, but not without boiling it. 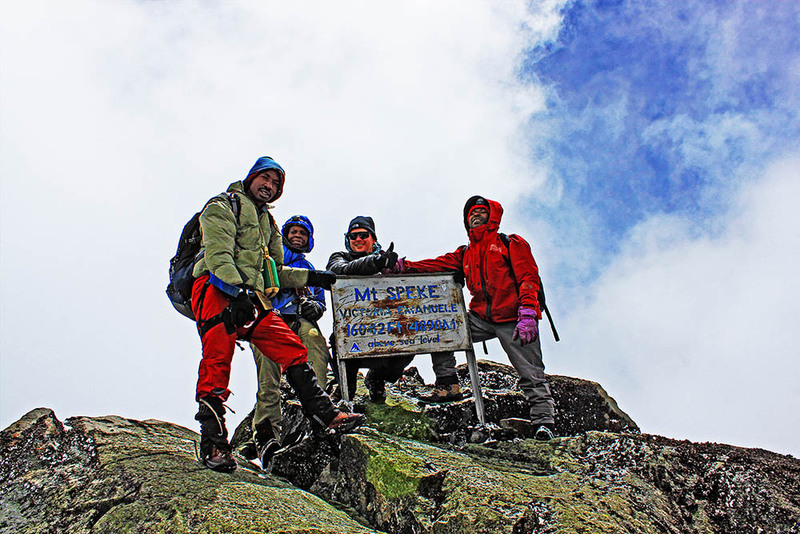 With an elevation of 5109 m it’s the highest mountain in both Congo and Uganda and the third highest mountain on the African continent after Mount Kenya and Mt Kilimanjaro. 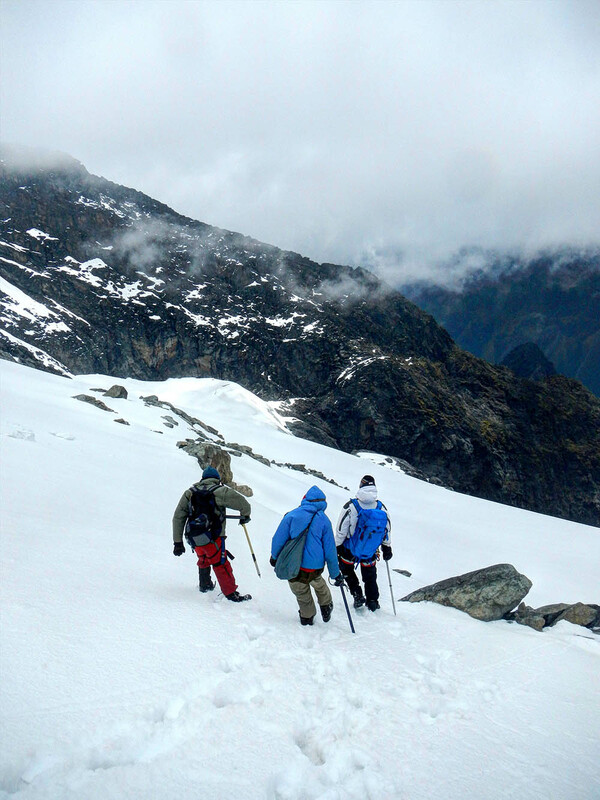 The peaks are actually high enough to support a glacier and it was named after explorer Sir Henry Morton Stanley. 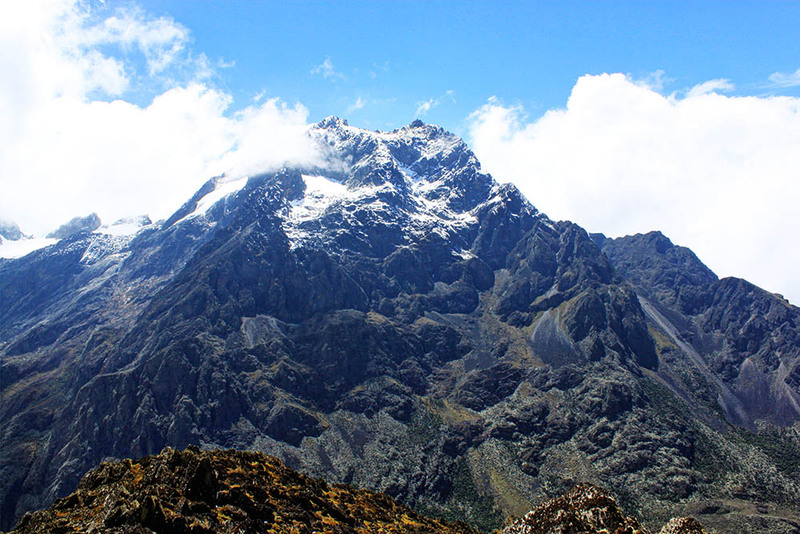 It’s part of the UNESCO world heritage site that is Rwenzori Mountains National Park and was first summited in 1906 by Duke of the Abruzzi and his fellow climbers and was named Margherita Peak after the Queen Margherita of Italy. 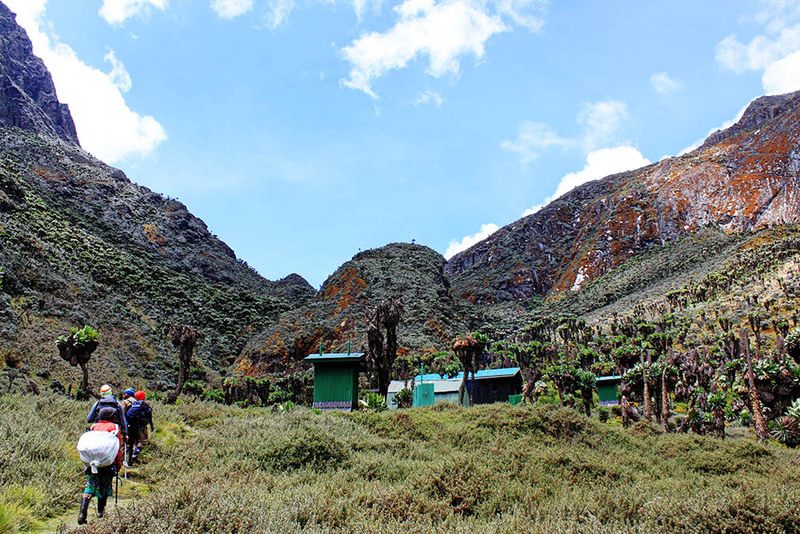 Mount Stanley is a mountain that should be taken serious, since there are no easy escapes down the mountain in case of altitude sickness or any injury. 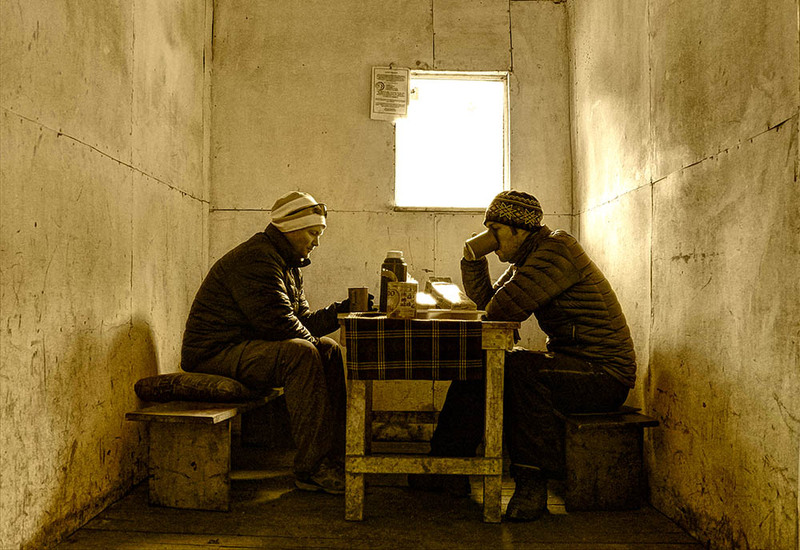 The help could be days away, and there is no medical support on the Mountain. 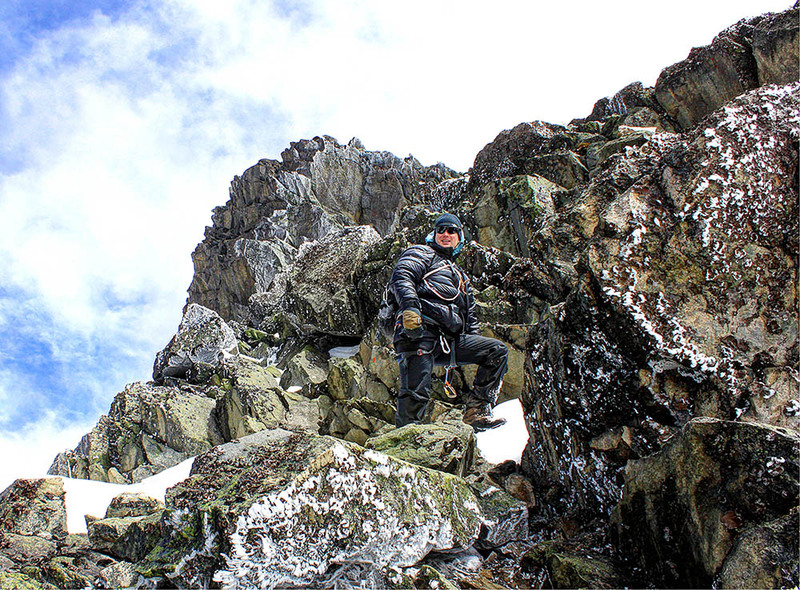 We reached the summit in February 7th. 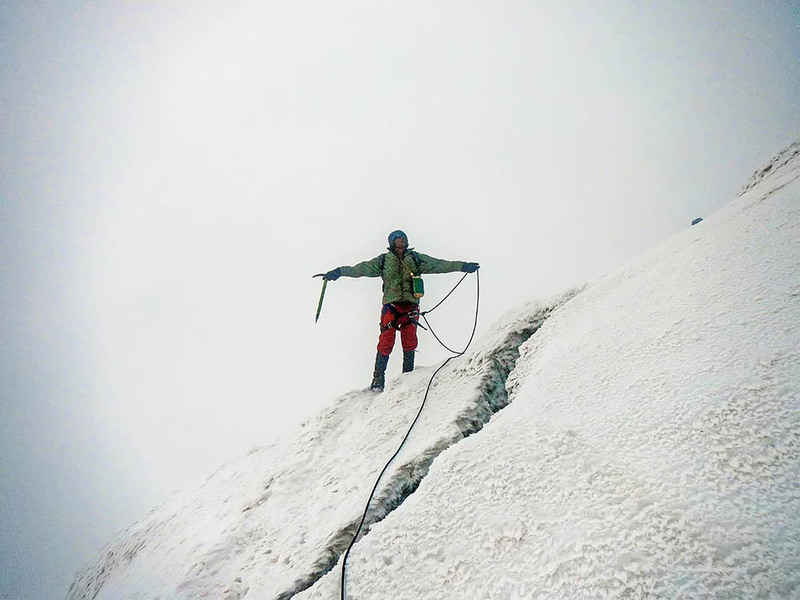 Earlier a ladder was used to get off the glacier, now it’s a new crux traversing a few metres on some narrow outcrops before ascending up a fixed rope that will bring you up on the North West Ridge. I found this climb less strenuous than Mt. Speke. 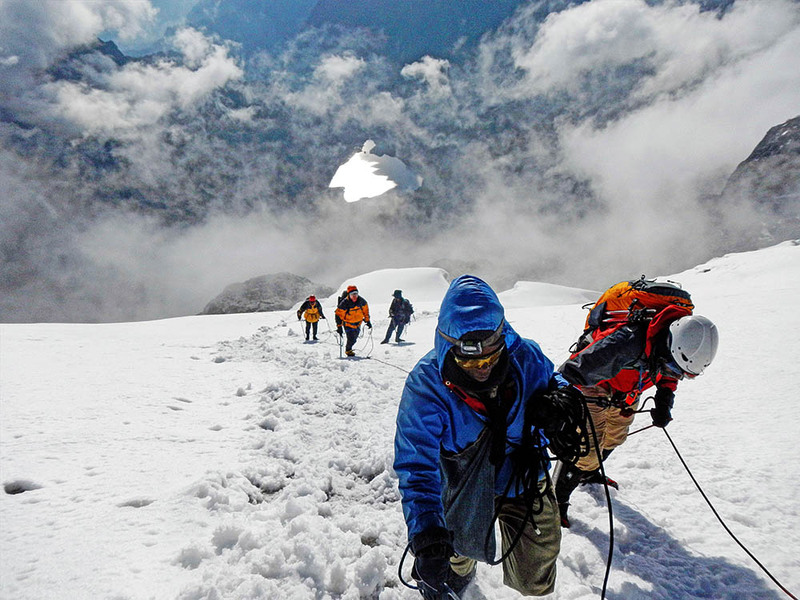 The climb starts at Elena huts on about 4500 m. We started the climb in complete darkness, and it didn’t take long before we reached steep ground, and a fixed rope, leading to the Stanley Glacier. 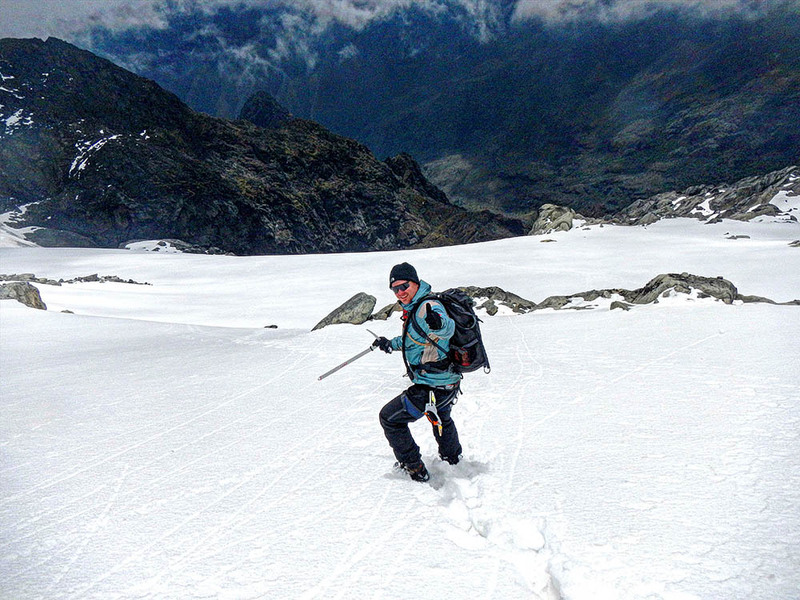 The glacier is a pleasant walk on plateau, roping was not necessary, and snow was not very deep. Now the sun was up, so we could actually enjoy walking. Still the mist didn’t give us much view. 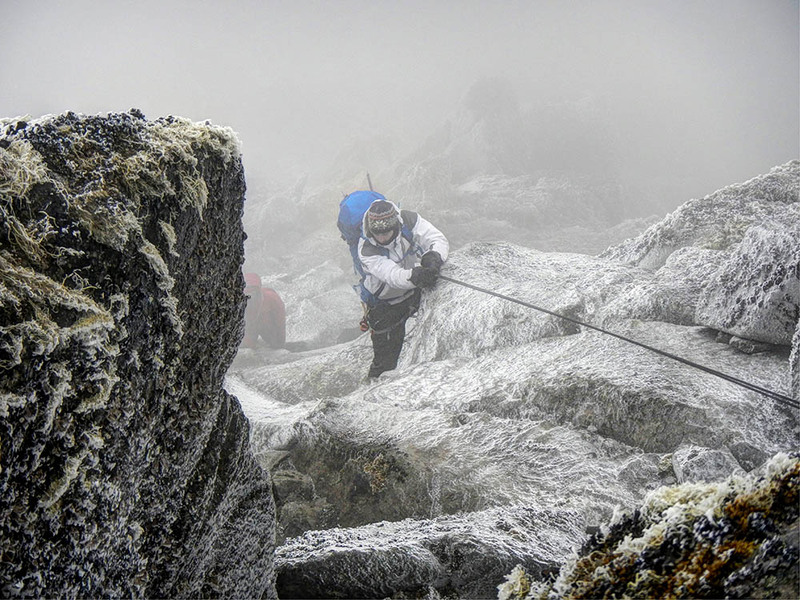 After a while we had to descend from the glacier around the foot of Alexandra peak, using another fixed rope (very good grips). From here we walked to the foot of the Margerhita Glacier where we put on crampons and roped up. The Glacier is pretty steep. At one point I dropped my camera on the snow, and had to throw my self after it like soccer goal keeper managing to save the precious photos before it descended to into the abyss. At this point the mist lifted and for about 10 minutes we had blue sky, sun and a clear view of the Bujuku valley and the two peaks Margerhita and Alexandra. It was such an amazing scene, and my best memory from the entire trek. 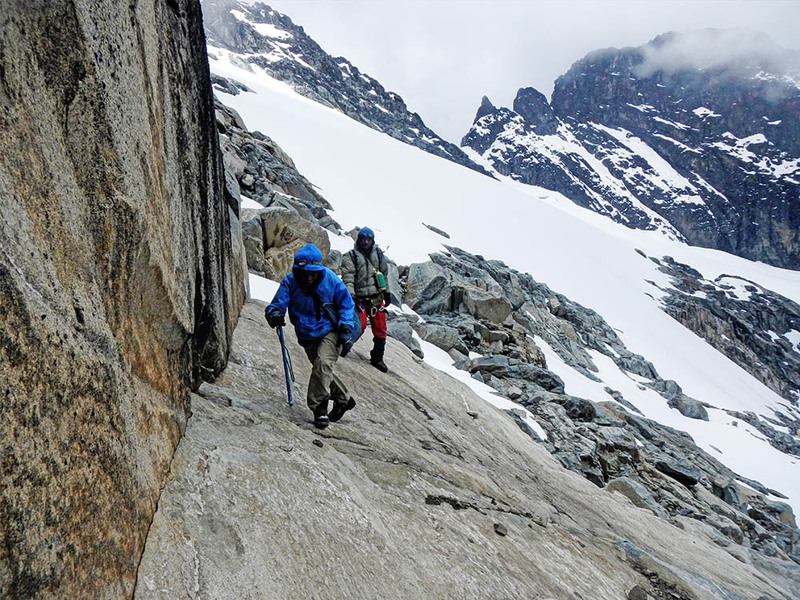 At the upper parts of the glacier we traversed left over a crevasse on to a narrow ledge of rocky outcrops leading to a steep gully with a fixed rope. 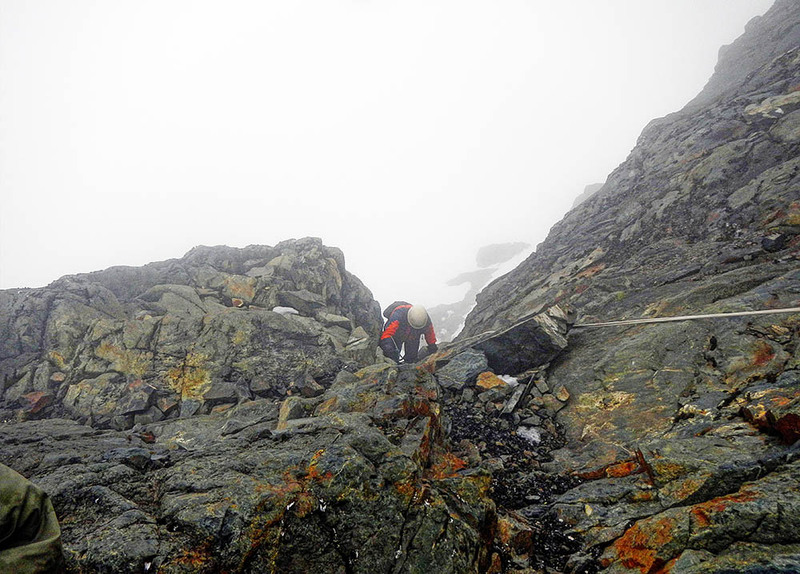 This section is the crux of the climb and pretty airy, and when we descended the rain we got had made the icy rocks very slippery making it difficult to traverse the ledge. It’s a grade 5 YDS, but a very short section. This route is fairly new and has only been in use the last few years. As the ice melts one will need to find new routes also in the future. As we came up the fixed rope the party was still roped together as such a fall would be fatal. 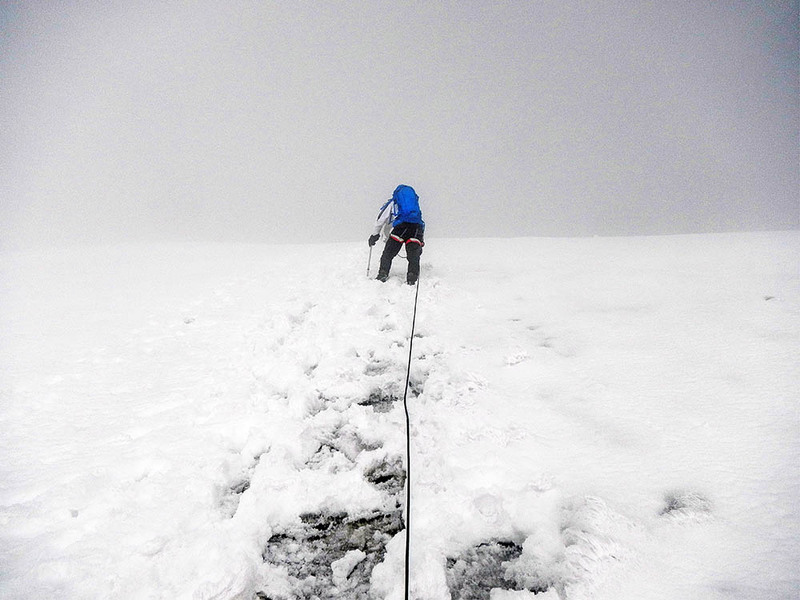 We then left the rope and took off the crampons as the rest of the way to summit was only a scramble. 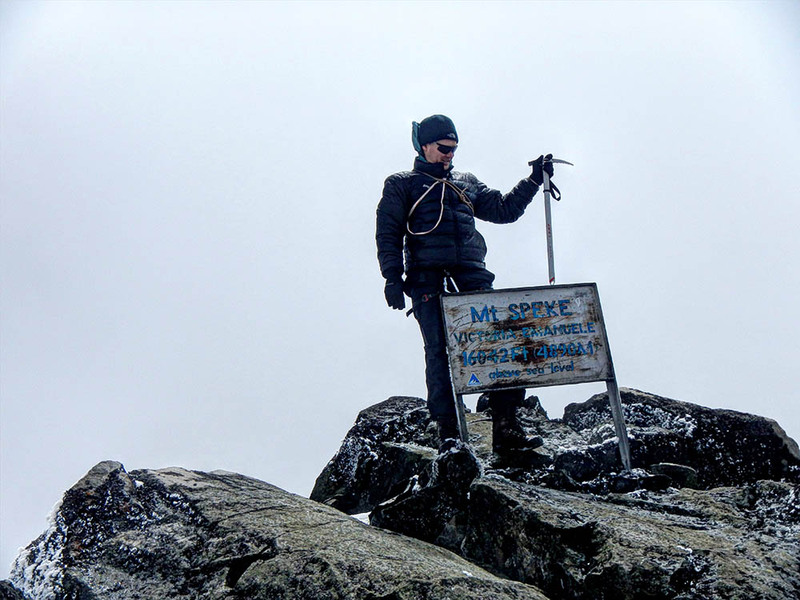 However, it started raining when we were at the summit making me regret that I didn’t bring the crampons up; because the water on the icy ground made the descend very unpleasant. There was enough room at the summit for photos, and we traversed the summit ridge further behind the big plate to a small cairn that shows the border between Uganda and Congo. 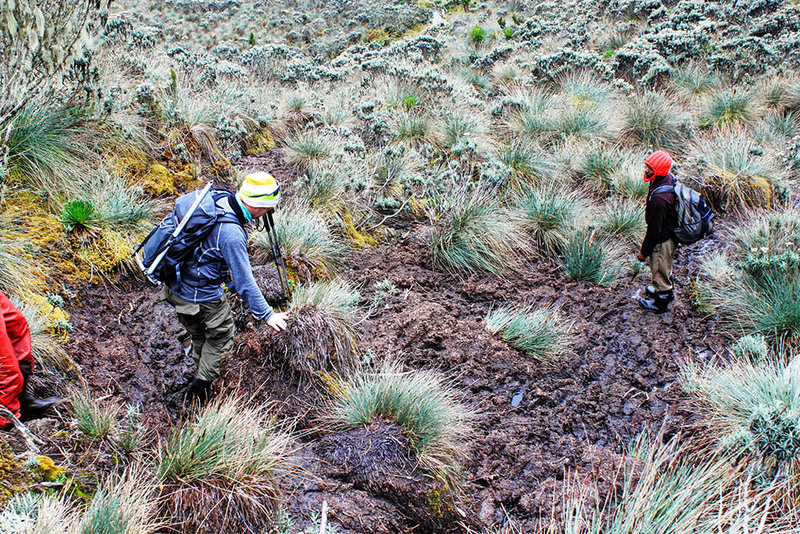 This is a very exposed area so we had to be careful, and only two people could stand in Congo side at the time as there is very little room, and steep drops on all sides. 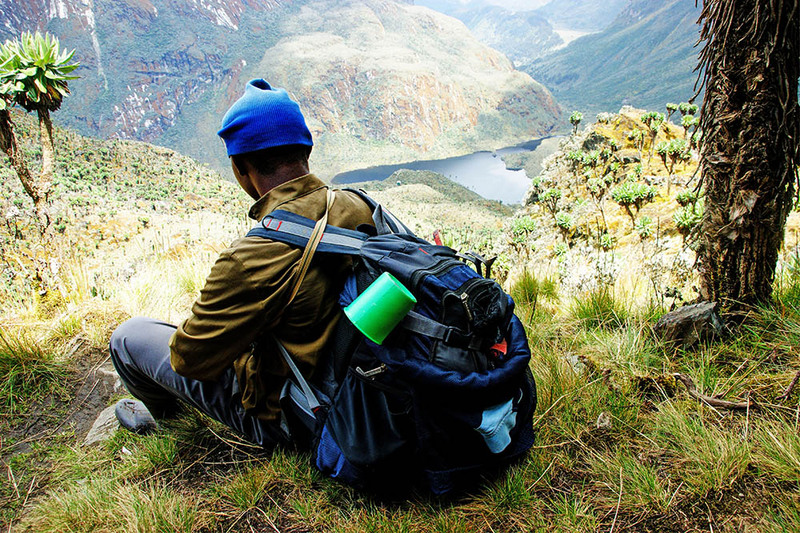 We followed the same route back, having a half hour break at Elena Hut before trekking 4 hours down to the beautiful Kitandara lake. I had injured my knee going up Margerhita (early in the morning), and at this point the knee had swelled considerably, and I was not able to bend it. This made both me and our guides very concerned considering we had a very long way back. 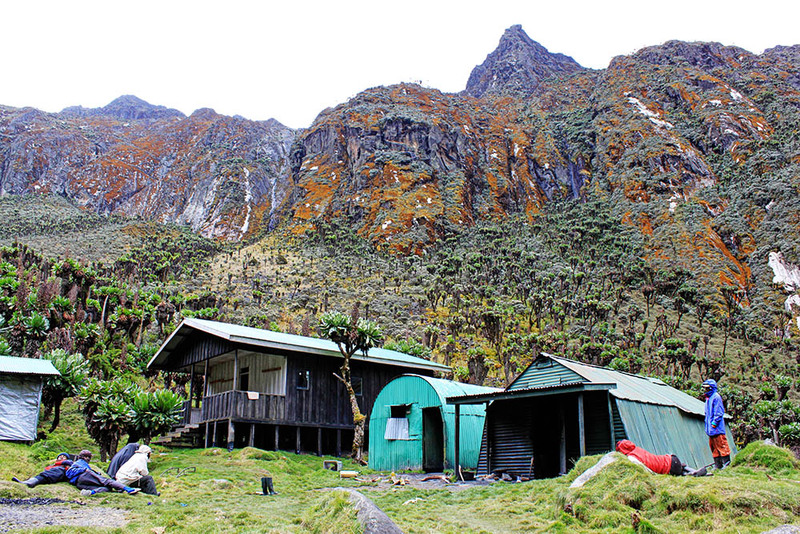 The scenary around Kitandara hut was breathtaking, and I guess I should celebrate that I now have added Africas 3rd and 4th highest mountain to my peak-list. However not being able to bend my knee made very concerned about the full day hike to Nyabitaba next morning. 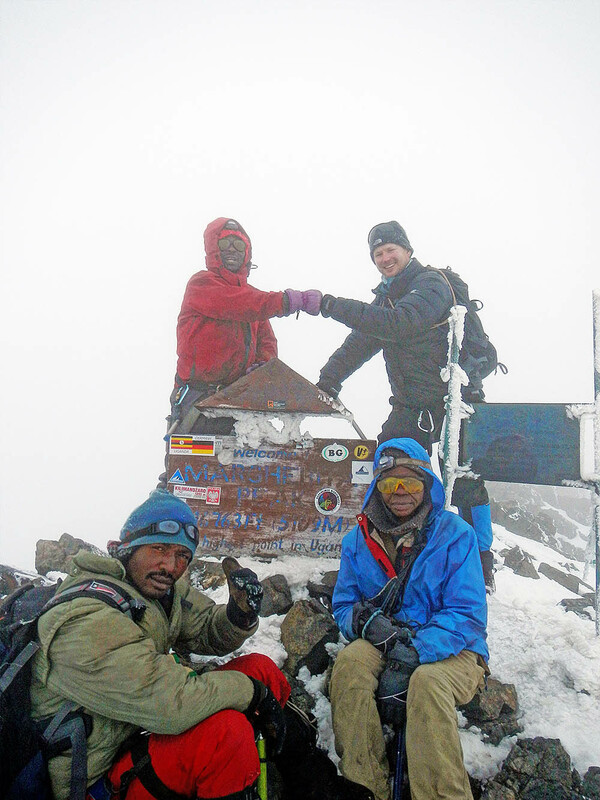 Day 10 Over Fresh Field Pass 4282 m. back down to Nyabitaba. This was going to be a very difficult trek. It took me several pain killers and a lot of will to get back down. 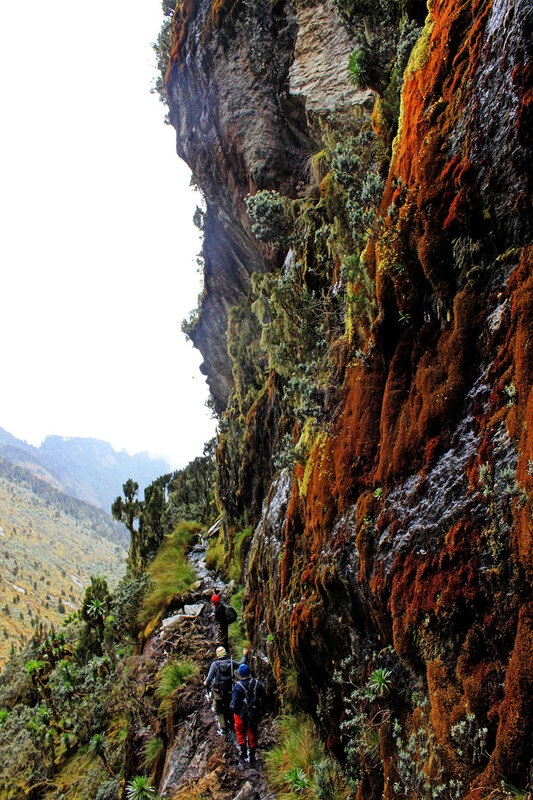 Recently a climber died at Kitandara from altitude sickness. He practically got trapped up there with no easy way down. We spent nearly 12 hours this day, and finally we got a taste of the rain these mountains are known for. When we reached the camp at night just as it got dark, I knew I had made it! The next day would be an easy return to the village. At Nyabitaba we had small cermony in the morning tipping the guides and porters. Andreas, the guides and I had an argument around the tipping, which is typical down here. It was not about how much to give, but the split between the crew. 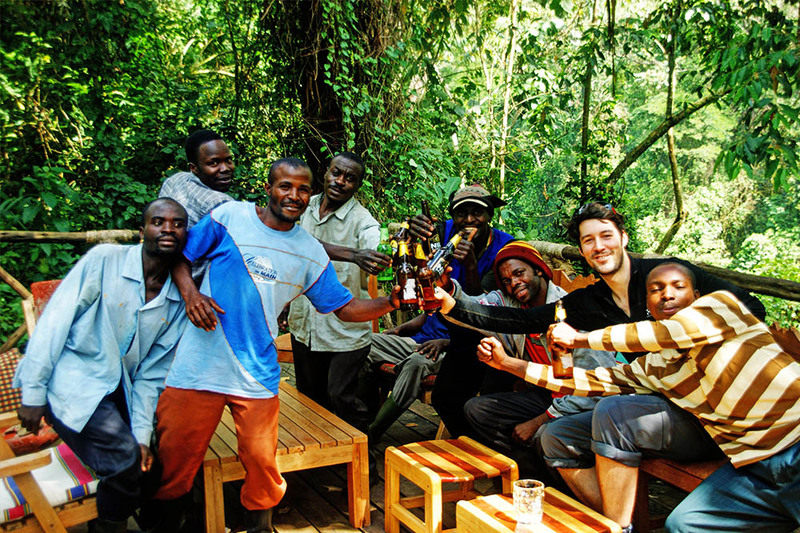 At the end everyone was happy, but it turned out that the porters was most happy with the beers we bought them at a lodge near the village. I have heard later that they still talk about this in the Rwenzori, as they had never experienced this from their clients before. It was certainly a cheerful moment that I will remember for the rest of my life. Back on the trekking station our driver had been waiting for several hours, and he was now anxious about driving us to Entebbe before it got dark. Once again we had a long drive (8 hours) full of wonderful impressions. However he realized that we would make it to Entebbe before dark, so instead we ended up in a hotel in central Kampala. The hotel was nice, but the bar a bit slow, so we wanted to head out on the town. We were advised to not leave the hotel after 8 PM, an advice we happily ignored. We had a great evening, celebrating in one of Kampala’s many bars, meeting great people. Day 12. Exploring Kampala, and flying out of Uganda. The following day we had plenty of time to walk around Kampala. It’ was sunday but busy as any day could be. The traffic was a joke, and the streets full of people. I was glad to experience it, but happy to escape it too. In the afternoon we were on our way to the airport, and on our way to Doha. I couldn’t help my self-feeling a bit sad leaving this beautiful country behind for this time. Many thanks to Jørn Eriksson of erikssonphoto.com for this wonderful contribution! Check Jørn Eriksson out on Facebook, google+, 500px.com/jorneriksson and follow him on Twitter. Jørn Eriksson is a Norwegian who describes himself as a an Adventurer with a camera, traveling around Norway and the world in search for adventures and epic playgrounds. He loves the outdoor life, and it's by documenting his trips that opened up his world into photography. 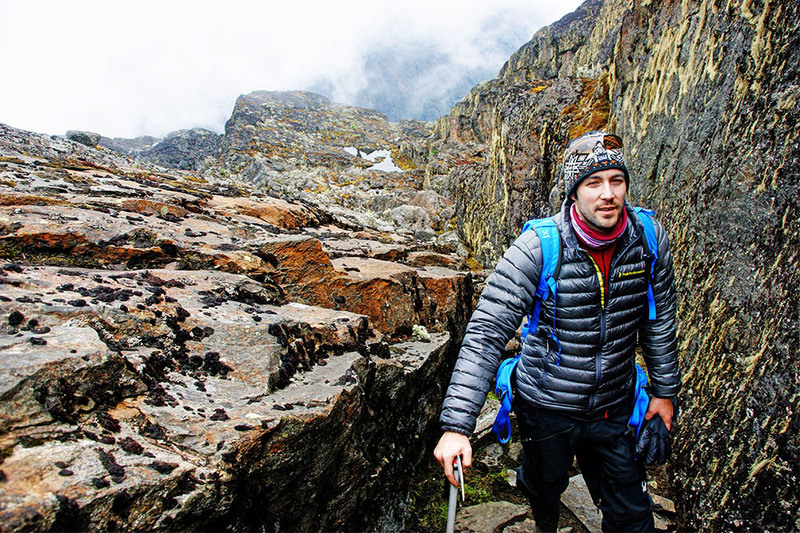 He has climbed several of the Highest Mountains in Africa, trekked the Himalayas, and skied down over hundred mountains in Norway and Europe. The hiking looks quite intense. I love the scenery and the snow covered slopes are awesome. It’s beyond my capabilities so thanks for the photos. Totally agree with Rhonda, the photos have done it for me..I wouldn’t even attempt..
Du inspirerer oss til å være mer ute i naturen. Vi skal gå opp Grefsenkollen neste uke, fordi vi er så inspirert av deg! Hilsen to trofaste følgere.